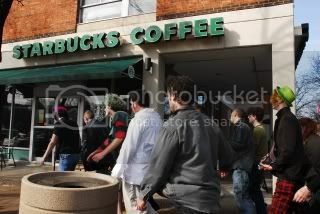 St. Louis, MO - Zombie Flash Mob!!! - March 18th 2006 - Zombiewalk.com - Your source for all Zombie Walk and Zombie Flash Mob planning! Incite mayhem in the streets for a good cause! Drop an e-mail to zombiesquad@gmail.com if you want to be sent details about this event. 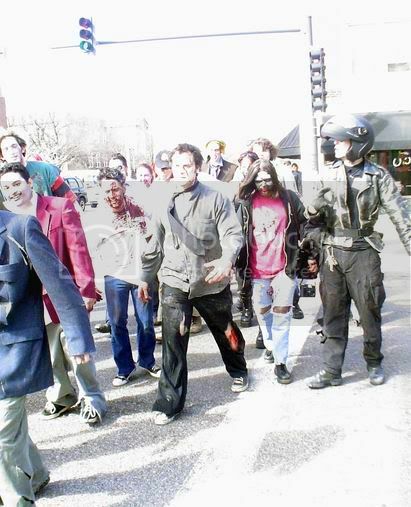 Zombie Squad and friends will be meeting at a central location around 1pm on Saturday March 18th in St. Louis. From there we will shambling through the cityas zombies while both annoying the general public and advertising for an up coming blood drive. How can you turn that down?!? It sounds like a good idea, except maybe the "annoying the general public" part. Again, I'm not trying to poopoo your event. In my experience if you want people to support your cause, it's important that you don't drive them away. Drive them away? Dude, the comment was a joke. Besides, I don't think you can have a Zombie Walk through a public place and NOT annoy anyone no matter how behave we are. The Zombie Squad St. Louis Zombie Walk was a success!! We'll get pictures from the Blood Drive> up soon (which was the point in the Flash Mob). It was a total sucess as well. Over 75 people showed up and 49 pints of blood were collected for the Red Cross. Of those donors 34 were donating for the first time. Much BBQ was consumed and many veins were stabbed. Unfortunately, we had to turn away at least 25 people because we didn't plan on such a huge response. That part sucked. Next time we will be prepared! 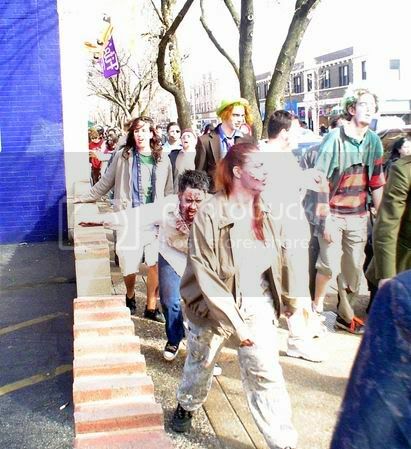 is there a st. louis zombie walk in the works?